[Bayless] – Earl Bayless, founder and president of Santa Clarita-based Bayless Engineering & Manufacturing, announces the purchase and installation of several state-of-the-art, large scale equipment units that will be used in the manufacture of precision sheet metal: a 4,000 watt fiber optic laser cell and two computer numerical control (CNC) press brakes from Ohio-based Cincinnati Incorporated as well as a large part robotic welder from Lincoln Electric. 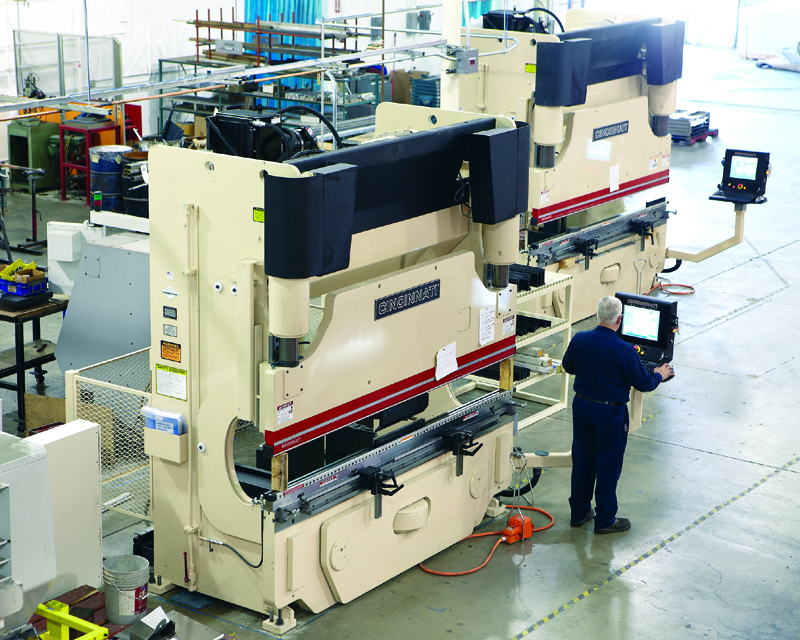 Bayless’ $2 million investment in this equipment automates many of the manufacturing company’s processes, leading to higher production volumes and faster turnaround times. “I was overwhelmed when I first saw the laser perform,” said Rod Smith, vice president of Bayless referring to the laser’s high-speed cutting ability. “This machine cuts metal up to 1,500 inches per minute, as compared to the previous equipment that was like watching grass grow.” The equipment is manufacturer Cincinnati’s first fiber-optic laser placement on the West Coast. Bayless’ new robotic welder processes five manufactured units per hour, as compared to the previous plant production of five units per day by hand. The CNC press brakes offer Bayless quick change tooling capability along with offline programming. “The updated technology reduces set-up time drastically, which cuts overhead costs,” said Smith. The higher volume is necessary to accommodate Bayless’ anticipated 25 percent growth in 2012. The company is currently running two shifts for a total of 20 hours per day production with 200 employees, which is a 25 percent increase over their 2008 pre-recession employment level and a 285 percent increase since the recession. Bayless and its affiliates occupy a three industrial building campus with 115,000 square feet of manufacturing space in the Valencia Industrial Center, located within the City of Santa Clarita’s Enterprise Zone. That designation has assisted the company in the investment of equipment and hiring of employees. Bayless also credits his banking relationship, which led to a combined effort to succeed. Bayless has found a niche market catering to companies that require quick turnaround, design changes, and custom fabricated parts. “We are very aggressive in seeking out contracts and we have a never-say-never attitude,” said Bayless referring to the long-standing relationship he builds with customers. In addition to precision sheet metal fabrication, laser cutting and job shop machining, the company also provides contract manufacturing and assembly, silk-screening, and powder coating, a process of applying a durable and protective cosmetic finish to metal parts. Offering a complete manufacturing process, the company serves diversified industries such as aircraft, medical/dental, machine tool, gaming, telecommunications, water purification, computers, vending and high-end audio. The “green” movement has added to demand for the company’s services and expanded the diversity of its products. Bayless recently began manufacturing electric car charging stations for commercial use and control boxes for wind turbines. For more information on Bayless Engineering & Manufacturing, contact Rod Smith at (661) 257-3373 or visit their web site at www.baylessengineering.com. I would like to thank you for the efforts you made in writing this post. I am hoping the same best work from you in the future as well. This information is really good and thanks for sharing it.